Interview: In J.T. Rogers’ “Blood and Gifts,” actor born in Pakistan dons robes and outlook of an Afghan in struggle against Russian invaders. At TimeLine Theatre through July 28. Our guy – the American – in J.T. 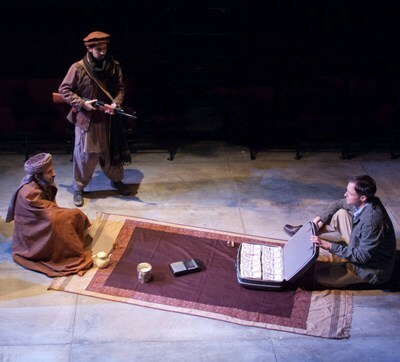 Rogers’ play “Blood and Gifts,” about the United States’ clandestine effort to blunt the Russian invasion of Afghanistan in the 1980s, is a CIA agent. We see the unfolding events through his eyes. But the character who elicits our sympathy and commands our imagination is an Afghan warlord called Abdullah Khan. He is made credible flesh and elusive spirit at TimeLine Theatre in a riveting performance by Kareem Bandealy, who says his portrait reflects both his own cultural heritage and the desperation that drives this unpredictable warrior. The gist of “Blood and Gifts” is that the CIA agent, outwardly working through official Pakistani channels, arranges a secret meeting with Abdullah Khan and offers to provide the Afghan resistance large amounts of cash, and eventually weapons, in exchange for information about Soviet military operations. As the Russians escalate their force, in both manpower and technology, the CIA agent and Abdullah both push for similar escalation on the American side. The Afghan even travels to Washington to make a direct appeal to Congress for greater assistance, including more sophisticated weapons. But in the end, as the Russians are in full withdrawal, a twist of fate spins the alliance between CIA agent and Afghan – a bond forged of mutual trust and respect – out of orbit. As if the earth had split open, the topography of friendship is altered forever, and that part of the world, indeed the world generally, suddenly takes on a new and far darker aspect. The cast also had required reading, books like Steve Coll’s “Ghost Wars: The Secret History of the CIA” and Tamim Ansary’s “Games Without Rules: The Often-Interrupted History of Afghanistan.” From this backgrounding, Bandealy fashioned his characterization of Abdullah Khan, a man at once proud and perceptive, gracious and willful. “A khan gains power not by subjecting, but by giving, by proving to be generous,” says the actor. “Being a good host means everything. 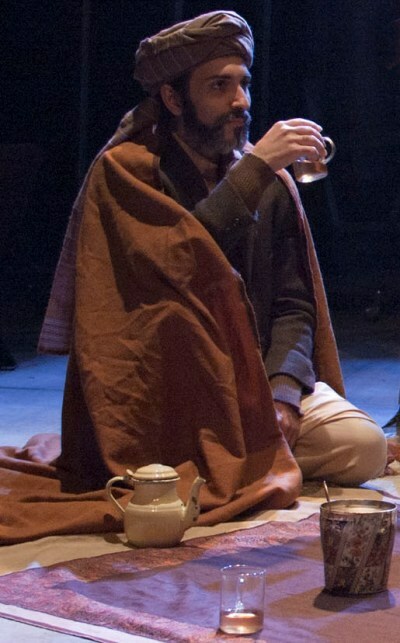 Whenever Abdullah receives Jim (the CIA agent, played by Timothy Edward Kane), he always offers tea. It’s a major thing, tea. Abdullah is a warlord not by choice. It’s something he fell into as a respected elder. The crucial rapport between Abdullah Khan and the CIA agent is forged in their first meeting as they cautiously take each other’s measure. The agent has brought serious cash; the Afghan, tea. Yet getting the tension right in that first encounter meant working around an ironic obstacle: the fondness of the two actors for each other. Director Nick Bowling had to remind the actors this wasn’t tea on the Magnificent Mile. The scene that posed the greatest challenge to Bandealy, and delivered some of the greatest rewards, is the Afghan warlord’s personal appearance in Washington, where he meets with Congressmen holding the purse strings of support and has a personal encounter with the most influential of them. “It’s got to be disorienting for this man from so different a culture. And as an actor, I suddenly feel as if I’m not in control, either. I always sense a younger physicality coming out, suggestive of someone who doesn’t feel in charge. Kareem Bandealy will play the role of Abdullah Khan through June 9. 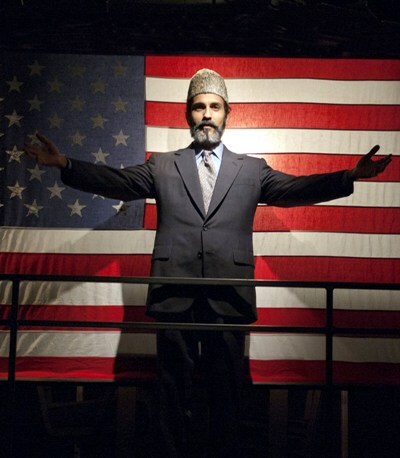 Anish Jethmalani, who currently portrays a Pakistani intelligence officer in the production, will switch to the part of Abdullah Khan for the remainder of the run through July 28.